Habit: Perennial herb from multiple, long, stout rhizomes, tufted or loose, generally 2--7 dm. Leaf: sheath open 1/2--3/4 length; ligule 1--4 mm, truncate to rounded, smooth to minutely scabrous at margin; blade generally 2--4 mm wide, soft to +- firm, flat or folded. Inflorescence: generally 6--15 cm, ovate to triangular; branches generally spreading, smooth or scabrous. Spikelet: callus densely long-cobwebby; lemma 3--4 mm, keel, marginal veins hairy. Flower: anthers 1.2--2 mm. Chromosomes: 2n=21--144. Ecology: Common. Disturbed habitats, including saline or alkaline soils; Elevation: < 3500 m. Bioregional Distribution: CA; Distribution Outside California: northern temperate; native to Eurasia. Flowering Time: Mar--Jul Note: Widely planted as lawn or pasture grass. Poa pratensis subsp. agassizensis (B. Boivin & D. Löve) R.L. Taylor & MacBryde is widespread and hypothetically native in California and North America, has dense inflorescence < 6 cm with smooth branches, leaf firm and folded, sterile shoot blade upper surface often sparsely soft-hairy; Poa pratensis subsp. angustifolia (L.) Lej., native of Mediterranean Eurasia, probably introduced in California, has long, folded sterile +- firm shoots generally < 0.5 mm wide, sometimes hairy as in Poa pratensis subsp. agassizensis, narrowly triangular open inflorescence with smooth ascending branches. 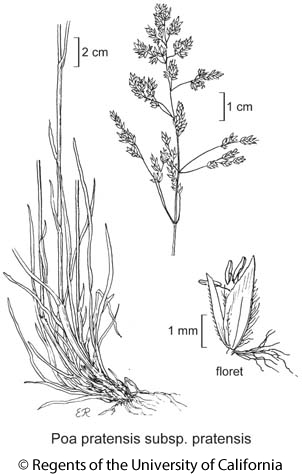 Citation for this treatment: Robert J. Soreng 2012, Poa pratensis subsp. pratensis, in Jepson Flora Project (eds.) Jepson eFlora, http://ucjeps.berkeley.edu/eflora/eflora_display.php?tid=70514, accessed on April 24, 2019. No expert verified images found for Poa pratensis subsp. pratensis.